Mackinaw Citys only Boutique Hotel. We feature themed, individually decorated rooms that are sure to make your visit to the Straits area a very special occasion. Our guestrooms have an aura of Old World ambiance reminiscent of an era gone by. The property has been awarded Budget Host Internationals highest award, the four lantern Award of Excellence for the past 8 years in a row. 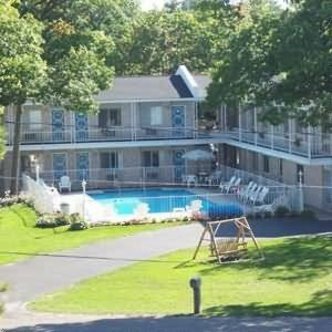 Our spacious, beautifully landscaped, shaded grounds overlook Lake Huron and the Mackinac Bridge. Our numerous flower gardens, punctuated with water fountains and a pond, feature hundreds of red Geraniums, Petunias, Sweet Alyssum, and Hostas, as well as assortments of Lilies, Hydrangeas, Mums and Ferns. Our sparkling outdoor pool is heated to a luxurious 88 degrees. The hotel is conveniently located within walking distance to attractions, shopping and dining.